BLOGGER COMMENTS: [Reckon] and ProPublica are sponsoring a panel discussion on the unique power of Alabama sheriffs: a power that we in Morgan County are all too familiar with. It's interesting that the two sheriffs attending are both brand new and have assumed command of two of the worse counties (as far as we know) in the state. We've had a lot of fun, and compassion, with our neighboring county and Sheriff Sims and his jail that can only be described, in Trump's words, as a sh*thole, and with the Beach House county. 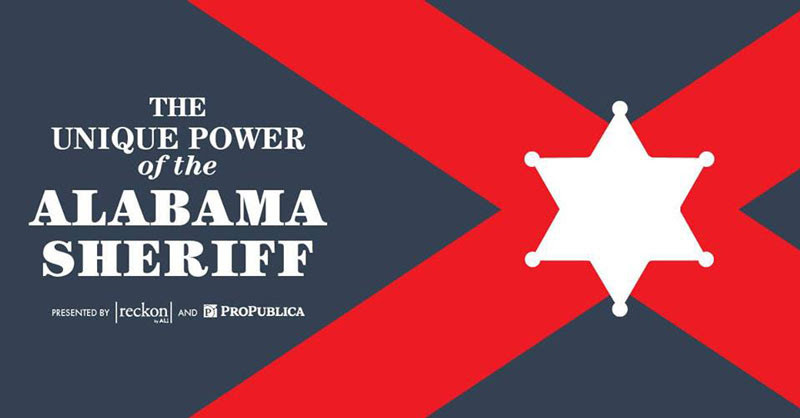 Join us on April 16 at Back Forty Beer Company in Gadsden, as Reckon and ProPublica host a panel discussion on the extraordinary law enforcement power wielded by Alabama sheriffs. In Alabama, each county has an elected sheriff. The sheriff is the law of the land for those who live or travel through their counties - but the law of the land differs wildly from county to county. Attendance is FREE but RSVP is required. Learn more here.